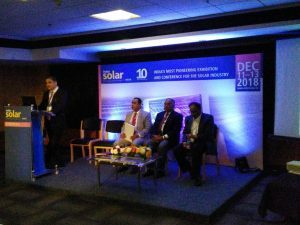 The multiple barriers such as quality shortcomings in solar technology, lack of technical know-how and problems with network quality which hinder large scale investment in solar energy in India. Thus, there is a need for financial de-risking instruments to improve investor’s sentiment and maintain the momentum of India’s progress in solar energy. The de-risking tools are expected to meet the expectation of all actors- investors, decision-makers and civil society organisations. A major fraction of the electricity supply in India is still generated on the basis of coal. However, due to the decreasing prices of solar energy internationally it is assumed that in the future solar power will be more profitable than coal energy. By end of 2017, 12.87 Gigawatt of solar power have been installed in the past three and a half years Ministry for New and Renewable Energy according to (MNRE) (Source : Energy Next, Feb2018). 17 GW of bids by end of March 2018 and 30 GW per year of bids shall be offered to the industry by SECI during 2018-19 and 2019-20. Despite this dynamic development, the country is still falling short of achieving its ambitious goal of installing 100 GW of solar electricity- generating capacity until 2022, though the ministry is optimistic that it shall it exceed the targets. The Indian government has calculated that investments in the amount of 79 billion Euros are needed in order to reach this objective, which is part of India’s climate protection plan. Hurdles for the envisaged expansion are quality shortcomings in solar technology, problems with the network infrastructure and a lack of know-how. These obstacles represent a central barrier for an increase of investments in the solar energy generation. Furthermore, national and international investors are concerned with the risk structure in the emerging country India. In order to address this issue, appropriate de-risking tools have to be developed, while the expectations of actors in the energy sector, especially the ones of political decision makers, investors and the civil society towards the further development of solar power have to be harmonised and stabilised. As there are differences in the nature of investments, such as generating power for the 300 million people without access to energy or covering the increasing power need of the industry and urban households, diverse de-risking tools have to be designed. The Energy and Resources Institute (TERI) and GERMANWATCH in association with Climate Action Network-South Asia (CAN-SA), Vasudha Foundation and the Centre for Science Technology and Policy (CSTEP) are working towards “De-risking foreign investments in the Indian Solar Energy Sector” through a multi-actor approach. The objective is to identify and formulate effective risk management instruments, with inputs from policymakers, financial institutions, civil society and sectoral stakeholders. The objective of the current workshop is to initiate dialogue on not only identifying key financial risks, but also to embark on a mission to formulate potential mitigation strategies and identify roles & responsibilities of key actors in the sector.